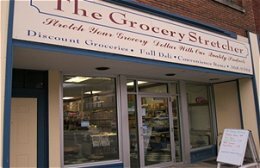 Stretch your grocery dollars with the quality foods offered by The Grocery Stretcher, 32 Main Street, Bradford, Pennsylvania. 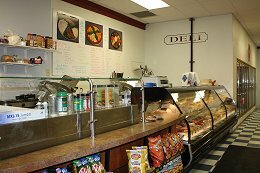 This hometown and home-owned old-fashioned grocery store features a deli case offering a delicious selection of fresh meats and cheeses including many Amish cheeses and meat specialties. Find many discounted prices for canned goods, cereals, freezer items, snacks, paper ware, baking goods, candy, spices, juices and drinks. Stop by to pick up a sub or wrap for your next picnic, or call ahead and order a sack lunch to take along on your next trail excursion. Food trays for your office or home party are available. Choose a veggie platter, a large sliced tray with ham, turkey, roast beef and 3 different cheeses or a cubed tray stacked with four different cheeses and pepperoni.